Happy Friday! First things first: it's my mom's birthday today!!! Happy birthday, Mom! I can't wait to see you in a week! 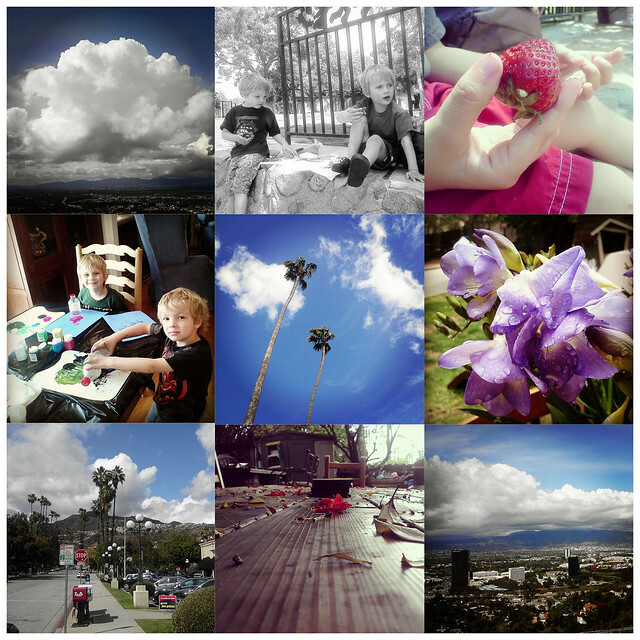 I made this photo grid using the process I discovered in this post. If you want to follow me, my username is chickpokipsie! :: Ron Weasley, you were always my favorite. :: I'm definitely guilty of thinking this way sometimes. :: A web site where you can "Artistify" any YouTube video of your choosing. :: Awesome, random art projects. :: Did you hear about the 340-ton boulder that was moved to LA a few weeks ago? They moved it to the LACMA, which is only a couple of miles away from my apartment, and we drove past the night the final leg of the journey and saw the trucks and lights and people waiting for it to arrive, and then we caught a random glimpse of it sitting in the lot a couple of days later. So much hype over a chunk of stone...but still pretty cool. :: Something I think about often: the sad but beautiful fact that we're all going to miss almost everything. :: A massive wave in Venice Beach on a high surf day. Someday I'll actually make it to the coast when these kinds of waves are happening! :: 15 ways to live and not merely exist (this goes along nicely with the name of my blog). :: The ultimate cure for writers block and lack of productivity. :: Starbucks now serves alcohol in its Calabasas location; more to come (oh dear god, please tell me there are more to come). California wins again. :: I love choreographed dances, and this glow-in-the-dark one is so well planned out and amazing that I just had to watch it a few times to get my fix. :: Having a bad day and need a good laugh? Like aerobics? Like watching 80s vidoes on YouTube? Watch this. :: "Lana Del Rey's" Hunger Games. Yes, I said Hunger Games. :: This describes how I feel far too often. :: True story: a tanker exploded in LA, at the exact time I would have been at the exact spot of the fire had I not accidentally taken a different route than usual home from work. I had to sit and think about this one for awhile. :: There are lots of articles and blogs about confidence, but in my opinion, this one takes the cake. :: I love me some e.e. cummings. :: A glorious video of a glorious older woman talking about aging, fashion, and beauty, as well as an article about the fear of aging. :: And last but oh-my-goodness-not-at-all least, a video about Caine's Arcade. I have already obsessed about this on Facebook and talked about it with all of my friends, and I am planning on checking it out this Saturday; you can bet a blog post will follow. So inspiring, so cute, so wonderful. Watch it and cry a little with happiness. That's all! TGIF fo sho. Catch you next week, have a fantastic weekend!